Young Nikkei lead the way in new initiative on mental health at 341 FSN. 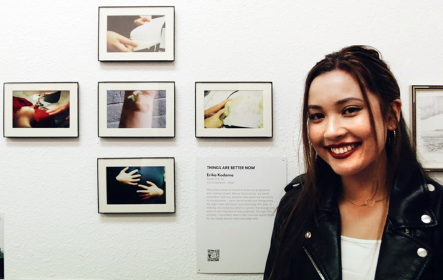 “Part of our mission is to spread the idea that mental health is something applicable to everybody,” says Ty Tanioka of Changing Tides, a new organization now hosting an art exhibition at 341 FSN in Little Tokyo. At the opening on Feb. 9, the small space on First Street was packed with people who came to see the works of art. The artists are multigenerational, with Sansei like Nancy Uyemura and Mike Murase contributing works, alongside young Nikkei like Moet Kurakata, Erika Kodama and Kendall Tani. 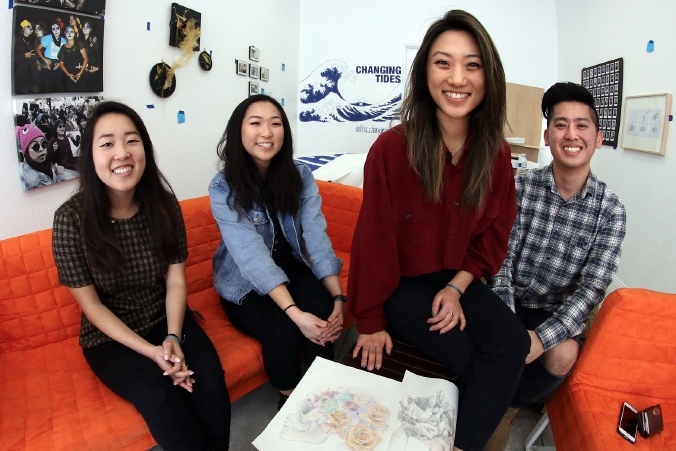 Creativity as an outlet for mental health is at the heart of Changing Tides, a Little Tokyo Service Center initiative, which grew out of a series of conversations last year. Courtlyn Shimada, whose mom Margaret Shimada is the director of social services at LTSC, said there is a real need to open up about mental health in the JA community. The Changing Tides crew are college-aged Japanese Americans. At 18, Katie Mitani is the youngest member; she currently attends El Camino College, and painted the group’s wave logo in the gallery space. She recalled dealing with stress and anxiety in high school. A committee of 14, including both younger and older members, met to discuss Changing Tides. There were intergenerational conflicts, but they were able to come to resolutions. Jessica Kanai of LTSC provided support to the crew. With admiration, she gave the young Nikkei credit for pulling together the show in less than a month. They also received help from Clement Hanami of the Japanese American National Museum. “It was crazy they were able to pull it off. It says a lot about what they’re capable of doing,” Kanai said. At 341 FSN, postcards offer resources for people seeking help with mental health. In other events, mental health professionals have been invited to speak. Kurakata, a member of Changing Tides, contributed a reflection on recovery, in two delicate pencil drawings. In one illustration, a jumble of hands and fingers form a tangled ball; in the second image, roses bloom from a human skull. “This represents that recovery is neither glorious nor always a struggle, and that it consists of everything in-between that is never really expressed enough,” Kurakata says. Tanioka said he was inspired to join the group after his experience as a freshman at UCLA. He experienced panic attacks and anxiety dealing with college life and ended up going to UCLA Counseling and Psychological Services (CAPS). His father, Kevin Tanioka, helped the group by creating a desk for the exhibition, where people could write out positive messages. “Especially in the Japanese community you don’t want to show too much weakness. It’s hard to share and talk about it. I hope it improves a lot more. Mental health is a huge issue in society in general,” Kevin said. Changing Tides presents CTXFSN, a mental health pop-up, runs from now until March 2 at 341 First Street North, Little Tokyo. For more information, visit thechangingtides.org.